The challenge of nurturing African violets in an indoor environment is one many gardeners tackle with enthusiasm. Because African violets have specific growing needs and will only blossom when you meet these needs, you must pay close attention to the growing environment you create for these intricate beauties. Proper moisture, fertilization and light are the key elements in ensuring the health and vitality of your African violets. If natural light is lacking, you can grow African violets under artificial light instead. Create the growing environment for your African violets. A bookcase with adjustable shelves is an ideal spot for African violets to grow as this will enable you to move the shelves to allow for the proper spacing between the plants and the lights. Install the fluorescent light bulbs into the reflector. The reflector will help to direct the light on the African violets, making the light more efficient. Install the reflector on the underside of one shelf. Place the African violets on the shelf approximately 1 foot beneath the lights. Keep the violets under the lights between 14 and 18 hours each day. Water the African violets by sub-irrigating them. When the top inch of soil in the containers is dry, fill a shallow tray with room-temperature water and place the planting containers in the water to allow the potting soil to draw water up into the containers from the bottom. Leave the containers in the water for 20 to 30 minutes before removing them. Pour room-temperature water over the top of each container once or twice a month to help flush accumulated minerals from the soil. Fertilize African violets once or twice a month. Mix the fertilizer with water at half the recommended strength and pour the fertilizer carefully onto the soil around the plants. The foliage of the African violet is sensitive, so be careful not to allow any fertilizer to splash on the leaves. 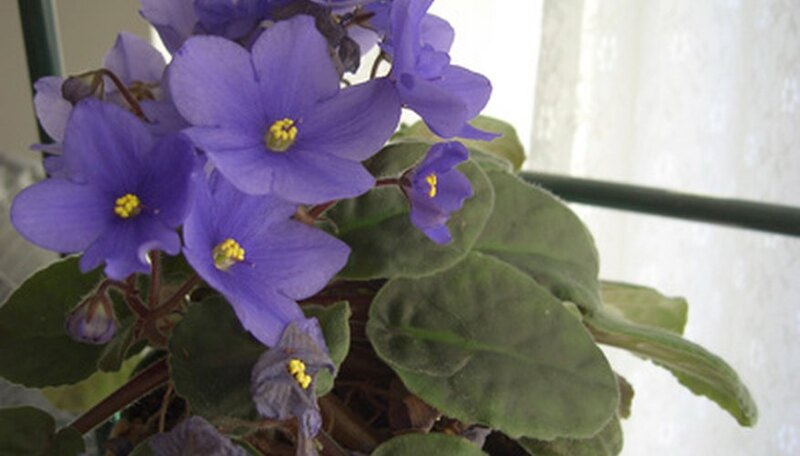 During the winter, humidity levels may be too low for the optimal health of African violets. Fill a shallow tray with gravel and water and place this tray beneath the African violets as they sit beneath the lights. This moisture will add additional humidity to the air around the violets.